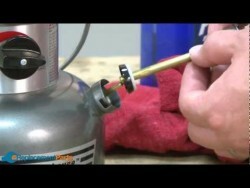 The Return Grommet is inserted in to the fuel tank on the outdoor products shown below. The the Return Fuel is installed into the Grommet. Its purpose is to create a seal and prevent fuel leaks. It may be easier to place the return fuel line in the grommet and install both in the fuel tank at the same time. The 51765 Line Pawl is one part of the mechanism on the reel that guides the line back on to the spool. It insures that a flat and smooth spool of line will be ready for your next cast.